Everyone loves loaded baked potatoes, right? 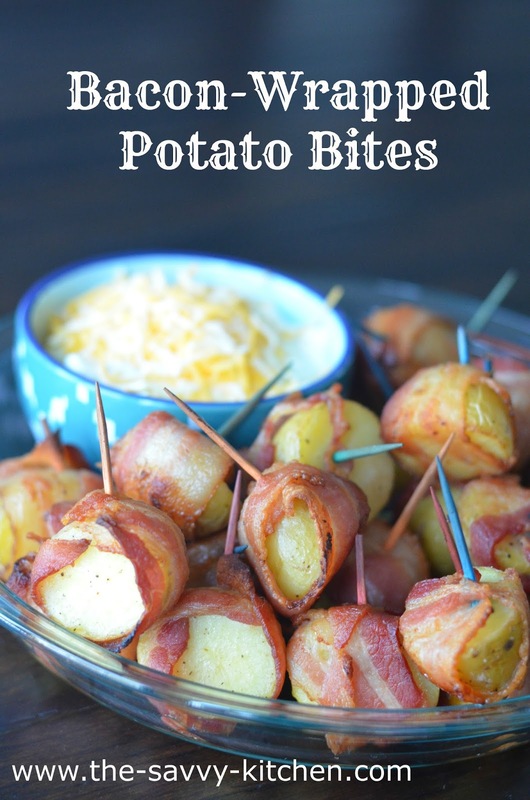 Put them in finger food form and you have a snack, side dish or appetizer fit for a crowd. They are simple to make and totally worth it. Enjoy! Wash and dry the potatoes. Chop them into 1-inch pieces, keeping the chunks roughly the same size even if they aren't the exact same shape. Put the potatoes in a medium pot, cover with cold water, and bring to a boil. Season the water with 2 teaspoons of salt. Once the water begins to boil, cook the potatoes for 3 to 4 minutes, until you can stick a fork into them without too much resistance. You want the potatoes to be almost, but not fully, cooked through so they won't fall apart during the next steps. Drain the potatoes and put them in a large bowl. Add the olive oil, 1/2 tsp. salt, and a few grinds of pepper, and toss until the potatoes are evenly coated. Wrap each potato bite in a piece of bacon, securing it with a toothpick. Put the potatoes on a baking sheet lined with parchment paper or aluminum foil spaced an inch or two apart. You may need to cook the potatoes in two batches. Cook the potatoes for 15 minutes, then flip each piece. Cook for another 15 to 20 minutes, until the bacon is cooked through and as crisp as you like it. Season the sour cream with salt and pepper and place in a bowl. Top with shredded cheese. 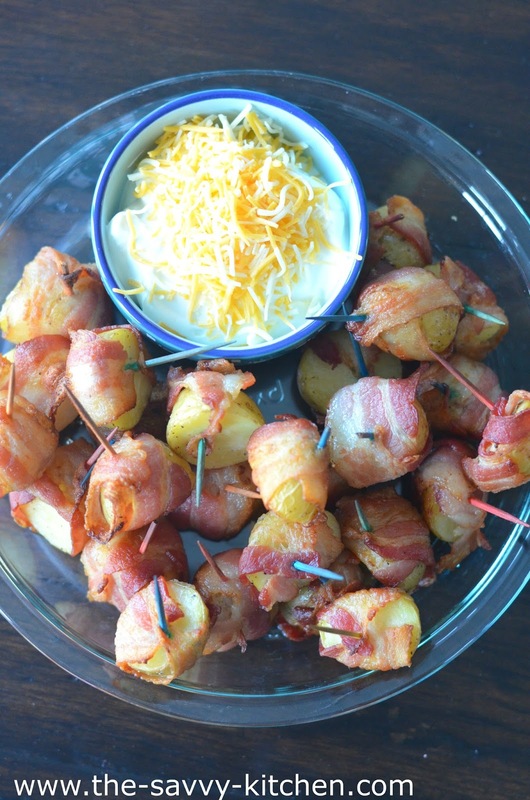 Pile the potato bites on a plate and serve alongside the sour cream dip.